The Beginning Like a Biblical plague, Spectres rise from their hives and swarm the hereafter. It's war between ghosts and Grandmother's legions, with the living none the wiser. The Spectres are winning by their sheer crush of numbers, but new hope arises. Can the characters survive long enough to save themselves and their allies? You decide, because one way or another, the end approaches. 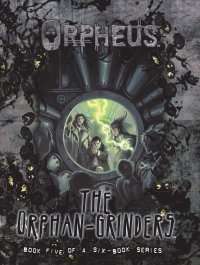 ... Of The End The Orphan-Grinders is the penultimate Orpheus supplement, and in it, the herafter suffers its greatest crisis. Presented here are new Spectres to plague the crucible, including the deadly Lawgivers. Yet, there's still hope. A new Shade emerges with its own unique Horrors. Discover these Orphan-Grinders and their shocking secret, which will change the direction of the war. Also included are Crucible Horrors and an entirely new chronicle option, a military-style program called Operation Black Mercury. Is this and End Game ever coming as PoD? Why this one (and End Game) isn't available for print on demand?